Qt provides two complementary sets of classes for reading XML files: The classes based around QXmlReader provide a SAX-style API for incremental reading of large files, and the classes based around QDomDocument enable developers to access the contents of XML files using a Document Object Model (DOM) API. In this example, we create a model that uses the DOM API to expose the structure and contents of XML documents to views via the standard QAbstractModel interface. Reading an XML document with Qt's DOM classes is a straightforward process. Typically, the contents of a file are supplied to QDomDocument, and nodes are accessed using the functions provided by QDomNode and its subclasses. The aim is to use the structure provided by QDomDocument by wrapping QDomNode objects in item objects similar to the TreeItem objects used in the Simple Tree Model example. The class definition contains all the basic functions that are needed for a read-only model. Only the constructor and document() function are specific to this model. The private domDocument variable is used to hold the document that is exposed by the model; the rootItem variable contains a pointer to the root item in the model. Each DomItem provides a wrapper for a QDomNode obtained from the underlying document which contains a reference to the node, it's location in the parent node's list of child nodes, and a pointer to a parent wrapper item. The parent(), child(), and row() functions are convenience functions for the DomModel to use that provide basic information about the item to be discovered quickly. The node() function provides access to the underlying QDomNode object. As well as the information supplied in the constructor, the class maintains a cache of information about any child items. This is used to provide a collection of persistent item objects that the model can identify consistently and improve the performance of the model when accessing child items. Since the DomItem class is only a thin wrapper around QDomNode objects, with a few additional features to help improve performance and memory usage, we can provide a brief outline of the class before discussing the model itself. If a QDomNode was previously wrapped, the cached wrapper is returned; otherwise, a new wrapper is constructed and stored for valid children, and zero is returned for invalid ones. These, in turn, will delete their children and free any QDomNode objects in use. 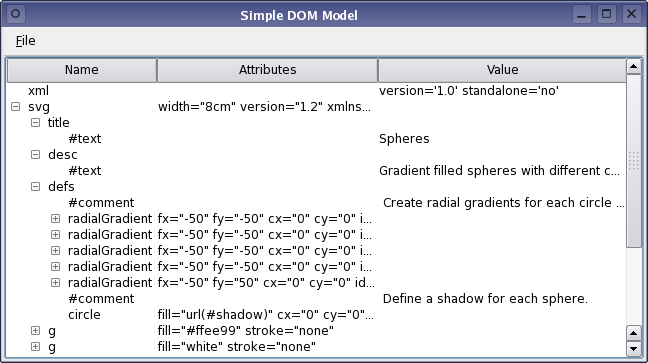 The structure provided by the DomItem class makes the implementation of DomModel similar to the TreeModel shown in the Simple Tree Model example. A shallow copy of the document is stored for future reference, and a root item is created to provide a wrapper around the document. We assign the root item a row number of zero only to be consistent since the root item will have no siblings. All of the child items in the tree will be deleted by the DomItem destructor as their parent items are deleted. Some aspects of the model do not depend on the structure of the underlying document, and these are simple to implement. This value is fixed, and does not depend on the location or type of the underlying node in the document. We will use these three columns to display different kinds of data from the underlying document. The model presents the names of nodes in the first column, element attributes in the second, and any node values in the third. A child item for the given row is provided by the parent item's child() function. If a suitable child item was found then we call createIndex() to produce a model index for the requested row and column, passing a pointer to the child item for it to store internally. If no suitable child item is found, an invalid model index is returned. Note that the items themselves maintain ownership of their child items. This means that the model does not need to keep track of the child items that have been created, and can let the items themselves tidy up when they are deleted. To obtain the relevant node in the underlying document, we access the item via the internal pointer stored in the model index. If an invalid index is supplied, the root item is used instead. We use the item's node() function to access the node itself, and simply count the number of child nodes it contains. For valid indexes other than the index corresponding to the root item, we obtain a pointer to the relevant item using the method described in the index() function, and use the item's parent() function to obtain a pointer to the parent item. If no valid parent item exists, or if the parent item is the root item, we can simply follow convention and return an invalid model index. For all other parent items, we create a model index containing the appropriate row and column numbers, and a pointer to the parent item we just obtained. attributes << attribute.nodeName() + "=\""
For the first column, we return the node's name. For the second column, we read any attributes that the node may have, and return a string that contains a space-separated list of attribute-value assignments. For the third column, we return any value that the node may have; this allows the contents of text nodes to be displayed in a view. If data from any other column is requested, an invalid variant is returned. Ideally, we would rely on the structure provided by QDomDocument to help us write the parent() and index() functions that are required when subclassing QAbstractItemModel. However, since Qt's DOM classes use their own system for dynamically allocating memory for DOM nodes, we cannot guarantee that the QDomNode objects returned for a given piece of information will be the same for subsequent accesses to the document. We use item wrappers for each QDomNode to provide consistent pointers that the model can use to navigate the document structure.